Nature provides a vast array of beautiful ingredients. Livinia's beautiful mineral make up is made from purified and crushed Australian Minerals, giving a beautiful radiant glow to the skin, enhancing your skin's own natural beauty. All of the ingredients used in the Livinia Mineral Make Up range are completely natural and free from harmful chemicals. Our products DO NOT contain bismuth oxychloride, dimethicone, talc, parabens, carmine, FD & C dyes or artificial fragrances. To offer the best possible natural sun protection, we use Z-cote (patented technology) , a powerful microfine Zinc Oxide. Because our Mineral Make Up is so pure and free from irritants, it is excellent for sensitive skins. It contains both Titanium Dioxide and Zinc Oxide, which have a calming effect on the skin. Livinia Mineral Make Up gives excellent coverage and covers skin conditions such as rosacea, acne and scarring. Livinia Mineral Make up is registered with the Vegan Society. Not tested on animals: we are against any animal testing and are accredited by Choose Cruelty Free. 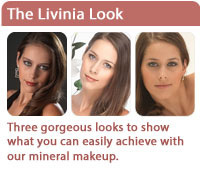 We are proud to declare that Livinia Mineral Make Up is Australian made and owned.